My husband and I were sitting in the room where we would get to see our baby for the first time. We could feel the excitement in the air. The technician came into the room. She placed the probe on my belly and then took it away quickly, asking us if this was our first ultrasound. Jokingly, trying to relax the atmosphere, my husband asked: “Are there two babies in there?” “Yes,” she replied. In a matter of seconds, we started to laugh and cry at the same time. I had always said that I wanted three children, and my husband would jokingly reply that that would only happen if we had twins. My dream was about to come true! Life was so good to us, I told myself. We were going to have twins, two little boys. I knew that taking care of two newborns would not be easy, but I had been chosen to do so and was thankful for it. The rest of my pregnancy could not have possibly gone any smoother. At every appointment, the doctor would confirm that all was going well, that I had a perfect pregnancy. That being said, a few days before I was about to give birth to my twin sons, I had a bad feeling. I went to see the doctor and told him that I thought the babies were not moving as much as before. He told me that it was normal at this stage of the pregnancy and sent me home. On the evening of October 25, 2010, my labour began. I was in my 37th week of pregnancy, which was quite exceptional for a twin pregnancy. I spoke to my little boys throughout the night. With every contraction, it was the right side of my belly, where Justin was, that seemed to move the most, which made me a bit worried about Jérôme. Why was he being so quiet? At 7 a.m. on October 26, we arrived at the hospital. I was really looking forward to hold my sons in my arms. When we got to the hospital, a nurse took me to the delivery room and examined me. She was having a hard time finding Justin’s heartbeat. At first, I wasn’t too worried as this had happened before during a routine exam and I was told that, in the case of twin pregnancies, the babies’ hearts sometimes beat at the same time. And moreover, why should I worry when Justin had moved around all through the night? At least that’s what I thought. A few minutes later, the doctor came to examine me, and he too had difficulty finding the heartbeat. I then had an ultrasound scan, which was also inconclusive. The doctor then told me he would get a more powerful machine that would allow him to see more clearly, but by that time I knew what the result would be. As I had had many ultrasounds during my pregnancy, I knew what I was seeing on the screen. A few minutes later, we got the confirmation. My world crumbled, and words cannot describe the sorrow that I felt. My dream was no longer. I would not be able to hold my two sons in my arms as I had imagined. I would not be able to see them learn to walk at the same time, nor to play hockey on the same team. I would not see them graduate from high school together, and Justin would not be able to be Jérôme’s best man at his wedding. That’s what it’s like to lose a child at such a young age. Some people think that when you haven’t had the chance to get to know your child, to see him grow, the grief is not as intense. But I had carried my son for nine months. I had talked to him the whole time, and more importantly I had imagined a future for him. That’s why parents are so excited at the thought of having a baby: we want to see them grow up. At that very moment, I wanted to scream, but I could not bring myself to. All I wanted to do was give birth to Jérôme to make sure he survived. I had to be strong for him, and to make sure he was born in peace and joy. This was the little boy who, the night before, had wanted to come out and, in so doing, had pushed against his little brother and caused him to move. At 1 p.m., I gave birth to Jérôme. They laid him against my chest for a few seconds. I couldn’t hold back the tears. I was so happy to hear him cry, yet I felt sadness at the same time. I was, at the very same moment, experiencing two events that are at the core of our very existence, life and death. During the two hours that followed, I was still in labour. Even if I knew that Justin was gone, I kept hoping, with every push, that I would hear him cry, that the doctors had made a mistake, that he was still alive. But at the same time, I was asking my grandfather to open his arms and to take him with him. I was reassured by the fact that he would not be alone. At 3 p.m., Justin was born in silence. After the delivery, I returned to my room to wait for my babies. At 4 p.m., Justin was brought to me. He was perfect, angelic even. I talked to him and showed him to the people who loved him. I spent only a few minutes with him. I would see him the next day and one last time on the day of the funeral. By 5 p.m., they had still not brought Jérôme to me. Through all my sorrow, what I didn’t realize was that he was fighting for his life. 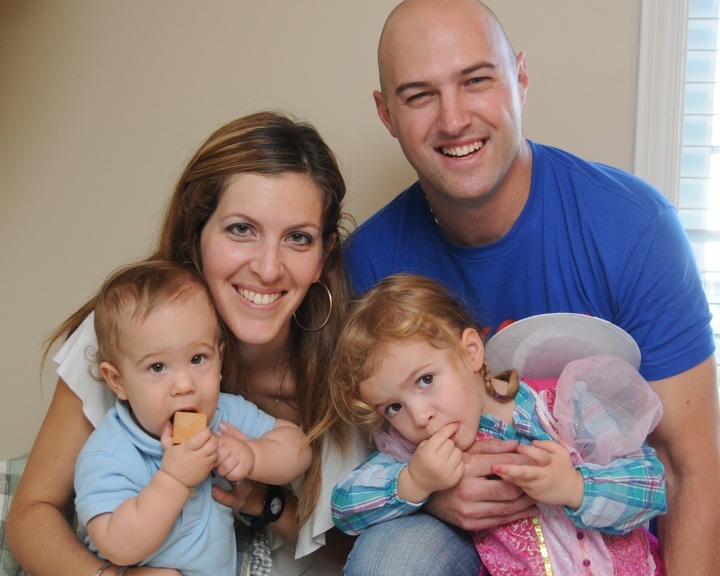 He was gravely ill and had to be transferred to the Moncton Hospital’s Neonatal Intensive Care Unit. Very late that same night, I was transferred to the Moncton Hospital and got to see Jérôme again. 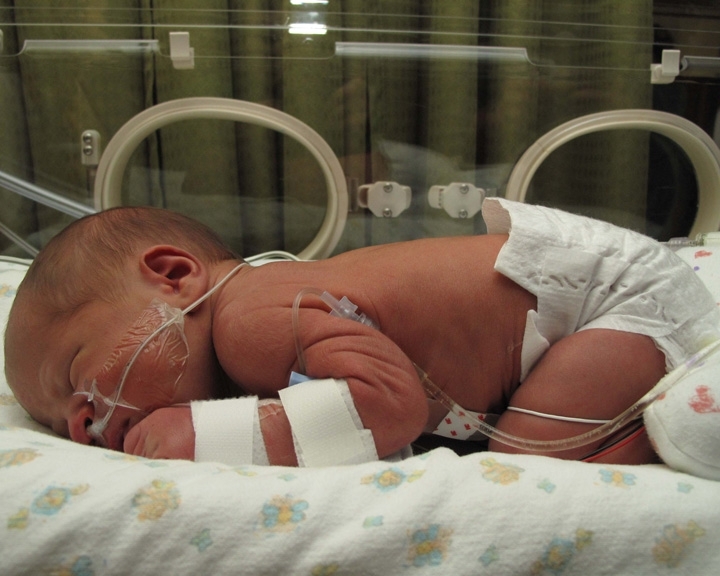 His tiny body was hooked up to a series of machines. He had difficulty breathing, but I knew that he would make it. Call it a mother’s instinct, but even though the doctors kept telling us that Jérôme was gravely ill, I knew that we would end up taking him home with us. 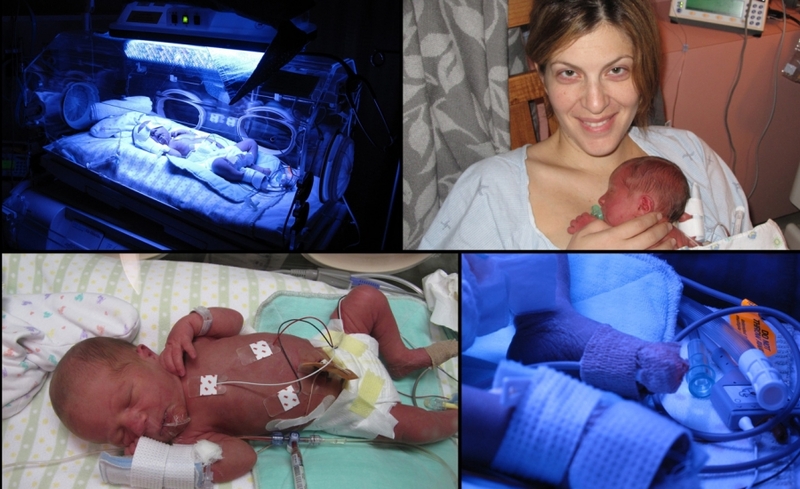 Jérôme spent nine days at the Neonatal Intensive Care Unit. Every day, I would talk to him through the small opening of the incubator and sing to him. Every time he heard my voice or his father’s, his heart rate would change. When they allowed us, I would take Jérôme in my arms, hold him close and rock him. The nurses and doctors were absolutely incredible. They are passionate about what they do and they care deeply about their patients’ well-being. I will be forever grateful to them. Not only were they there for my son, but they also made sure to take care of my husband and me at a time when we were going through two very difficult ordeals: one of our sons had just died, while the other was fighting for his life. Through this whole ordeal, we witnessed a few small miracles. The day before Justin’s funeral, Jérôme was still in the intensive care unit and we thought that he would be hospitalized for at least another two weeks. The day after the funeral, the doctor told us that Jérôme’s condition had improved dramatically overnight and that we would be able to take him home in 48 hours. To this day, I firmly believe that this was a gift from Justin, to help us heal. Returning home was certainly not easy. Some things were especially difficult: entering a bedroom that was ready for two babies, dismantling Justin’s crib and taking out one of the car seats. The weeks to follow were difficult. At first, I thought I would never get through it. There was a knot in my stomach that would just not go away. And that tightness we feel in our throats just before we start to cry would also just not go away. The nights were the hardest. I would wake up around 3 a.m. and could just not stop crying. Sometimes, I would feel better for an hour or two before the pain would come back to haunt me, suddenly and unexpectedly. That’s when people tried to console us by telling us that at least we had one of our sons. When I heard those words, I could not believe what I was hearing. When we lose a parent, are we consoled by the fact that we have one left? When you lose a child, there are no words to describe it, as Linda Lemay says in one of her songs. When you lose a child, there are in fact no words because it is not in the natural order of things. People would also say that time heals all wounds. Even if I knew that they were right, I still did not want to hear those words. What I wanted was my son. I wanted to go back in time. And I asked myself all kinds of questions. Had I given birth sooner, would I have my two boys today? Should I have asked more questions? Sometimes, I would be furious. Why us? What had we done to deserve this? Jérôme was about 5 months old when I finally got to meet other mothers like me. This was a tremendous help in my healing process as I finally had a chance to talk to people who knew exactly how I felt. They too had lost a child either shortly before or after birth. From the outset, I was able to share with these women, who I didn’t know before, my deepest feelings. The more I talked about it, the better I felt. When I gave birth to my sons, I told myself I didn’t want to become the mother who mourned the loss of her child for rest of her life. I had to continue living and growing for my two other children. That’s exactly what I was able to do by talking to other mothers. A few months later, I came upon a book entitled Lorsque grossesse devient tristesse (“Pregnancy and sorrow”), which again allowed me discover other women who had gone through a similar ordeal. I could see their photos and read their stories. That’s when I told myself that I wanted to do the same thing: I wanted to tell my story in the hope that it would show other parents that it is possible to live again after losing a part of oneself, and that we must never forget that we were chosen among millions of people to become the parents of little angels that will watch over us forever. Renee, my thoughts are with you and your husband. I know how hard the last months must have been, but by reading your testimonial, I can already see your little angel is guiding your threw these hard times. Thanks for your generosity and your courage. Sharing your story will help you in your grieving process, but most of all, will help other parents just like us. My heart holds you both, Isabelle and Renee, as well as your families. I too have lost a son, our first born, Carter. My pregnancy went very smoothly; it was a beautiful experience. On November 14, 2011; 37 weeks pregnant I was in labour. On our way to the hospital it was not excitement we felt but a calmness; like our hearts knew the road our journey was about to take. The nurses had trouble finding a heartbeat, one I had heard in the Doctor's office just days before. We both new we had lost our first born. Within a couple of hours I gave birth to our son, Carter. Our hearts filled with love and joy with meeting him and great sorrow as we were saying goodbye. We spent time with him; holding him. Family gathered to meet him. That day is truely a milestone in our lives. Our lives have been touched by an angel. As we move through this experience we are now celebrating his life not mourning it. We know in our hearts he is with us every moment and every step of this journey he has given us. We are grateful he chose us as parents. Chrissy, my heart is also with you and your family. As I was reading you story, I could not help but think that our angels are doing exactly what I thought they would... they are bringing us together. Helping us grow and help others. That's the gift that our sons gave us. Thank you very much for sharing! With your permission, I would love for your story and Renee's to become testemonials, just like mine. That way, a lot more people could read them and see that they are not alone. If you agree, just write me an e-mail at info@lesailesdupapillon.com.